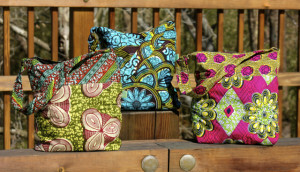 Timbali Crafts is an income generating sewing project for women in Swaziland, Africa. In this tiny nation with the world’s highest HIV/AIDS & TB rates and a low life expectancy, the needs are immense. The 110 women who create Timbali Crafts are all volunteer cooks at feeding centers for orphans and vulnerable children. In their rural communities of Engculwini and Nsoko they help to feed more than 2500 children daily. 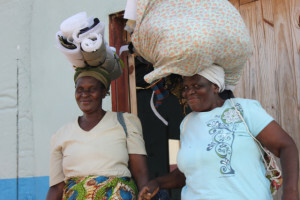 women goes to help with the basic needs of their families such as school fees, medical care, food, and housing. The women are also assisted in saving throughout the year, in preparation for school fees due each January. Timbali reaches out in emergency situations with food baskets for families who have lost a loved one, or have a special need, and also medical care when needed. Timbali Crafts was started out of a weekly Bible study with some of the women, and pointing them to Jesus continues to be the central goal. The Timbali women take part in regular Bible studies and also attend a yearly camp, where they are spoiled, laugh a lot, eat a lot, sing a lot, dance a lot, and have the love of Christ poured out on them! It is the highlight of our year!